In the four years since the last major version of Microsoft Office, Entourage has probably come under more attack from Apple’s applications than any other member of the Office suite. OS X’s Mail, Address Book, and iCal have all come to offer credible alternatives to Entourage’s core features. So how does Entourage 2008 stand up to Apple’s triumvirate? Pretty well, especially for users working in a corporate environment who use an Exchange server for their e-mail and calendar needs. For the rest of us—overall—Entourage is still superior to Apple’s offerings. Entourage maintains its advantage because it has built a strong feature set over the years, especially in e-mail. But Entourage 2008 offers few exciting new features, leaving the program vulnerable to Apple’s next onslaught. Entourage finally looks like a native Mac application. Entourage 2008 was rewritten as a Universal Binary, running equally well on Macs based on Intel and PowerPC chips. (For me, the Universal conversion also solved Entourage 2004’s annoying tendency to bog down on Intel Macs.) Part of that transition included a revised user interface, which makes the program easier to use. Gone is the odd, non-standard toolbar; in its place is a familiar-looking Apple-style toolbar, which can be set to show icons, small icons, icons and text, or just text buttons. You can now add and subtract items from the toolbar, at long last bringing toolbar customization to Entourage, a feature the other applications in the Office suite have had for a decade. Entourage’s new reliance on Spotlight for searching speeds up searches dramatically, but the program still retains its wide array of search criteria. The new mini-month under the Folder List allows you to quickly jump to a date in your calendar. Right underneath the main toolbar you’ll find the new Favorites Bar, which allows you to add shortcuts to items in the Folder List, so you can get to them with a single click. This makes it a snap to jump to the Inbox, one of your saved mail searches, or the new To Do List. Entourage is first and foremost a heavy-duty e-mail program, and its e-mail features have been refined, but for the most part not overhauled. You’ll still find excellent tools that help you organize your e-mail flood, such as the Mailing List Manager and fine-grained Rules that, in my opinion, ace Mail’s similar feature. Some features have new locations or work differently. For example, there’s a Search field in the main toolbar that performs a Spotlight search on your mail, replacing the previous Advanced Search dialog. As in any Spotlight search, you can add multiple criteria to your search, and restrict its scope—to particular mail folders, in Entourage’s case. You can save searches to the Folder List or the Favorites Bar. Spotlight integration also makes searching through your e-mail much faster than it is in Entourage 2004. The junk mail filter, which in Entourage 2004 became hopelessly out of date and useless, has been updated; when it was set to the High option, I found that it actually worked well, catching almost all junk mail. Microsoft has promised more frequent filter updates to keep up with the spamming arms race. Time will tell if, as in the past, Entourage 2008 falls behind and users need to again resort to extra spam-fighting help like C-Command’s excellent SpamSieve ( ). One minor but welcome change: when you select and delete mail from the Junk e-mail folder, Entourage deletes it forever, rather than just moving it to the Deleted Items folder as in the 2004 version, where you would have to delete it again. A new anti-phishing feature automatically blocks a long list of potentially malevolent file attachments, such as scripts and executable programs, and alerts you to suspicious links in e-mail that may lead to a fraudulent Web site. There are several other new or improved features relating to e-mail or calendaring, but they apply only to users in corporate environments that connect to a Microsoft Exchange server. (For more on those features, see Entourage 2008 and Microsoft Exchange.) Given that it’s been four long years in the making, it’s a missed opportunity that Entourage 2008 hasn’t also added some of the best new features found in Mail, such as automatic detection of physical addresses and dates, or e-mail stationery templates. While I find Mail’s templates cartoonish, the concept of stationery is valuable. Presumably Microsoft’s business-oriented user base would inspire a more tasteful implementation of them. For all users, the calendar looks better, benefiting from the overall user interface overhaul. My favorite new calendar feature is small but useful: you can now set the mini-month to appear in all parts of the program, even mail. This is perfect for quick reference when working with a mail message, and a single click on a date jumps you there in your calendar. Other Entourage modules, such as Address Book, Notes, Tasks, and Project Center, remain largely unchanged. It’s disappointing that Projects, in particular, haven’t improved, as they could use some obvious enhancements, such as better sharing of projects in a workgroup. The new My Day companion application gives you a view into your Entourage data even when the program isn’t running, displaying your upcoming calendar events and To Do items, which can include flagged e-mail messages. It’s nice to get a quick look at your schedule, but My Day is limited to viewing events, creating new Tasks, and marking To Dos as complete. My Day is okay as far as it goes, but it isn’t enough; you can’t create new events with it, and if you need detailed information about an event or need to change it, you must open Entourage anyway. Because I want to get my e-mail throughout the day, I just keep Entourage running all the time, and I can always put it in one of Leopard’s Spaces to keep it out of the way when I’m doing something else. If Entourage is running, then I don’t really need My Day. A fairly common complaint from longtime Entourage users is that the program’s database was fragile and prone to corruption, requiring all-too-regular use of the included Database Utility to repair and rebuild it. Microsoft says it has done extensive work to make the database more reliable, reducing the need to rebuild. Over the course of two months, working with both the beta and the final shipping version, I experienced no database problems. As a test, I rebuilt the database anyway, and noticed an improvement over a similar rebuild in Entourage 2004: the rebuild no longer loses synchronized data such as e-mail in remote IMAP, Exchange, or Hotmail folders, or the links between items inside Entourage. Entourage uses a single database file to store its information, and that file can become quite large over time. When Apple released Spotlight, Microsoft created a workaround so Spotlight could index and search Entourage’s e-mail messages: it replicates each message as a small text file in your User Library folder. But there’s no such workaround for Leopard’s Time Machine backup facility. If you receive even a single e-mail, the whole database is marked as new, and Time Machine will back the entire thing up every hour. If you’re short of backup disk space, you might consider excluding ~/Documents/Microsoft User Data/Office 2008 Identities/ from your Time Machine backup, and regularly backing up that directory using another method. When it comes to supporting typical Mac OS X technologies, Entourage is still ahead of the rest of its Office stablemates. Though all of the programs have the useful Services submenu in their application menus, it is active only in Entourage. And though all of the Office programs support AppleScript, Entourage has by far the most complete implementation. As a new feature in the regular and Special Media Editions (but not in the lowest-cost Home and Student Edition), Entourage provides eight sample workflows for Automator, letting you do things like create a zip archive for a group of messages, or print selected messages. Unfortunately, you can’t yet run these workflows from the program’s Script menu under Leopard; they work fine under Tiger. Microsoft says it is working to fix this. Entourage works reasonably well with OS X’s Sync Services, allowing you to synchronize your Entourage contacts with Apple’s Address Book, and the Entourage calendar and tasks with iCal. You can also sync these and Entourage’s Notes with .Mac. Then you can use .Mac, iSync, or third-party synchronization software to transfer your data to and from other Macs or mobile devices such as smartphones. And of course, this shared data can also be used by iTunes to synchronize with iPods and iPhones. My complaint about Entourage’s calendar sharing with iCal is that Entourage assumes that it will be your head calendar honcho. When you first synchronize Entourage with Sync Services, it creates an Entourage calendar in iCal, replicating your Entourage events in iCal. If you add or change events in that Entourage calendar in iCal or on a mobile device, those events will be synchronized back to Entourage’s internal calendar. But there’s no way to bring events from other iCal calendars (such as the default Home, Work, or Birthdays calendars) into Entourage’s internal calendar. Put another way, Entourage can publish data to iCal, but can’t subscribe to any of iCal’s other calendars. In effect, Entourage uses iCal as a convenient conduit to synchronize its data to other devices, but doesn’t treat iCal as a full calendaring partner. I discovered a few minor bugs, some in all of the Office 2008 applications, and some particular to Entourage. All of the programs seem to occasionally miss clicks on their windows, and fail to bring the window to the front. You can usually work around this by switching to the program using the Dock, then choosing Window: Bring All To Front. In Entourage specifically, a couple of times I saw a message window fail to redraw correctly when resized, and some of the Mail Rules I’d been using in Entourage 2004 didn’t work until I opened and resaved them in the new version. Microsoft acknowledged the latter bug and is working on a fix. 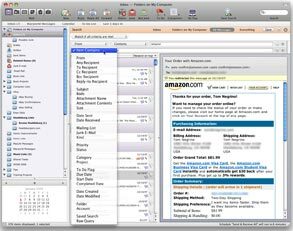 The programs that come with Mac OS X, especially in their Leopard incarnations, can easily satisfy people with lighter e-mail, contact, and scheduling needs. For Microsoft’s corporate customers, Entourage 2008 is an improved Exchange citizen over previous versions, which will help Macs better fit into Windows-centric organizations. Finally, if you’re outside of the corporate realm, and need a mail, calendar, and contact manager with lots of headroom and solid integration with the rest of the Office suite, Entourage provides a wealth of features that are deeper than Apple’s trio.